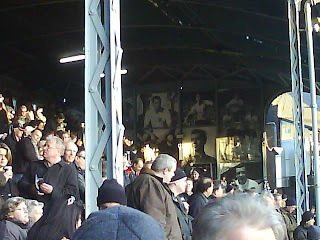 It being a cup game I found myself in the Johnny Haynes stand yesterday for the F.A Cup quarter final against Spurs. I'd thought when booking the tickets it would be good to be closer to the action. We'd been in the Riverside for the Shakhtar match and enjoyed the change of scene. The old Stevenage Road stand is shallower and really we were too low to have a great view of the action, that combined with my own sense of foreboding and a tight and, at times, scrappy affair led to an uncomfortable 90 minutes. In fact I can't remember enjoying a game that we've not lost less. As the last few minutes ticked away I could visualise both the elation of a goal for us and the gut wrenching disappointment of a goal for Spurs. 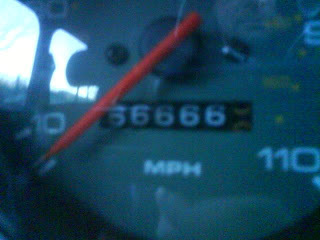 During the week my Mini had reached the unusual landmark of 66,666.6 miles, something that I noticed approaching by chance and managed to capture on camera. Note to any Police officers reading this, I had pulled over and safely parked the car before taking the shot. It did take a bit of doing though to find somewhere suitable at the right moment. This felt like it might be an omen of some kind. You'll probably realise by now I'm quite superstitious. The first half seemed to be all Spurs. They're no Shakthar Donestk, but they made more use of the ball going forward. Fulham struggled to find any rhythm but remained stoically organised and limited Tottenham to a weak header from Peter Crouch and a Kranjar shot from the edge of the box. Crouch, who was all elbows and whinging, may well have risen to my top five most disliked players in the premier league. The second half was much better, as Fulham attacked with more purpose and the game opened up a little. We really missed the guile of Danny Murphy in midfield. Jonathan Greening can be a tidy player but I could count the number of forward passes he made on one hand and none of them had the direction or purpose that Murphy might have achieved. Our forward play therefore tended to be a bit repetitive and lacked any real drive or speed of thought. Too many times we'd break down the wing but then slow down the play until we had few options available or simply gave the ball away. I felt yesterday was an occasion when switching the wingers might have shaken things up a bit. Duff and Davies (though to be honest the Welsh wonder had a poor game) bombing down the wing and slinging a cross into the box might have created something our patient build up could not. Though, I guess, that's not really us. Credit goes to Dickson who had a fine game in the middle and also Chris Baird who seemed to see a lot of the ball. On a positive note we're still in the hat and will at least know who we might face by the time of the replay. The initiative is definitely with Tottenham now but we've got nothing to lose. Maybe Murphy will be back and we'll have one more massive performance in us. I don't know what's sadder. Your delight at your old banger reaching some milage landmark or the fact you're a fulham fan. And if you're such a fulham fanatic why don't you have a season ticket? You and me were watching a different game if you thought dickson played well. we has been poor for the last few weeks. Cup games are included in my season ticket, which I've had for twenty years. Why don't you get the option to sit in your usual seat? Ed - I agree Dickson been's poor since his return from the ANC but I think he's improved in the last couple of games. He does the job he's supposed to do, not his fault Greening wasn't up to the task of replacing Murphy. Stoney - I could have done that but sometimes it's nice to try somewhere different. I just got my angles wrong this time.